A driver for Korns Bakery in Brooklyn is lucky to be alive on Thursday morning, after he swerved to avoid a deer and ended up in a serious crash. 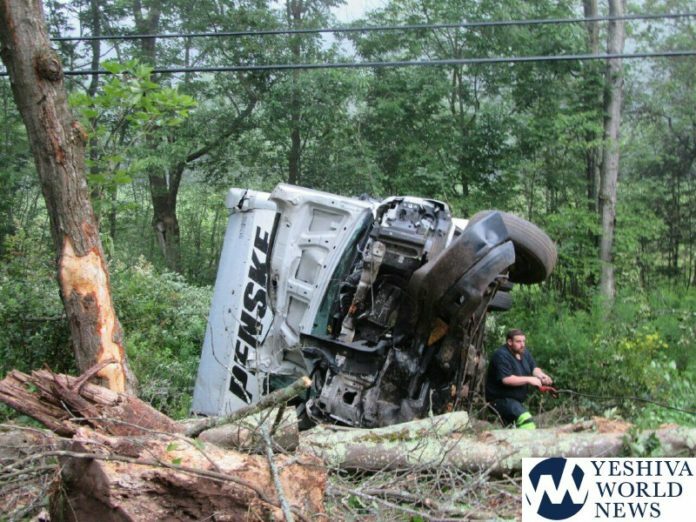 Sources tell YWN that the incident happened at around 6:00AM on Old White Lake Turnpike as the driver was making early-morning deliveries of fresh bread to camps and stores in the Catskills. 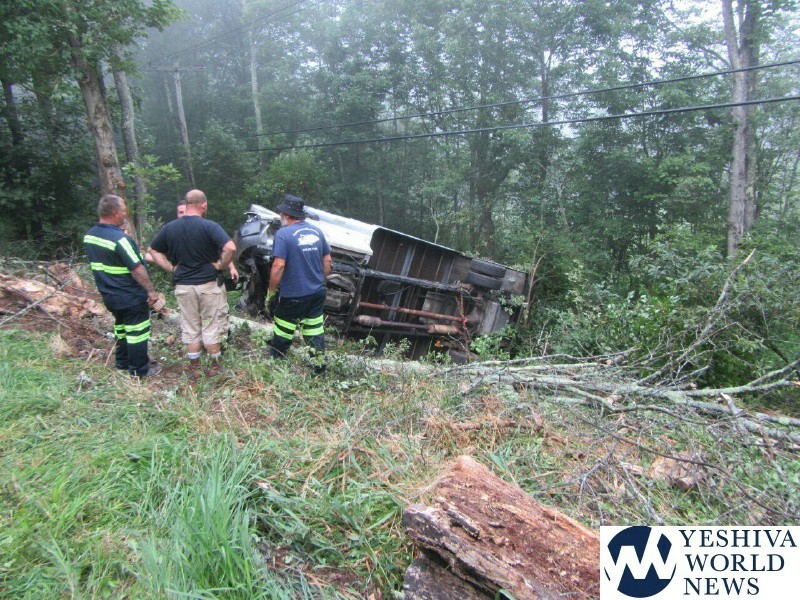 As the driver came around a bend, a deer darted out in front of the truck. The driver took evasive action to avoid hitting the dear, but lost control of the vehicle. The truck slammed into a tree and overturned onto it’s side before coming to a stop in the wooded area off the road. 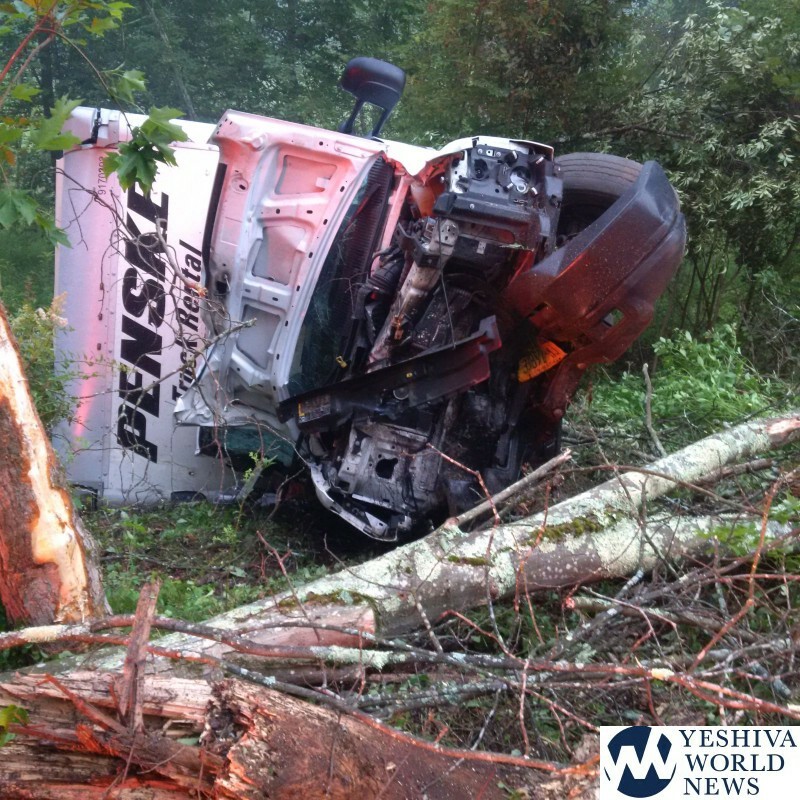 Catskills Hatzolah responded to the scene, but miraculously, the driver had only suffered very minor injuries. Some local camps came to the scene to pick up their bread delivery. 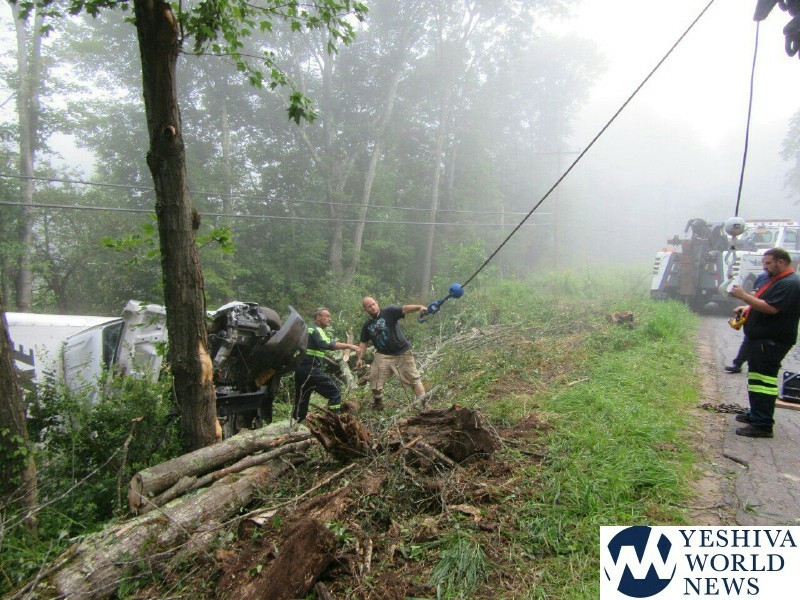 YWN has previously reported a number of accidents with deer this summer. According to the Insurance Information Institute, 1.6 million deer-vehicle collisions occur each year, resulting in 200 fatalities, tens of thousands of injuries and over $3.6 billion in vehicle damage. Being prepared can help prevent you from adding to these statistics. Watch for the rest of the gang. Deer are pack animals, and rarely travel alone. If a deer crosses in front of you, chances are there are more nearby. Slow down and keep an eye out for more deer darting across the road. Timing is everything. Deer are most active at dusk and dawn: periods when your vision is most compromised. To add to their terrible timing, deer are on the move during mating season (between October and January) when you’re more likely to travel after the sun sets. Slow down and stay alert, especially after dark. Wear your seat belt. It may not prevent a collision, but if the inevitable happens a seat belt can reduce injuries. This is especially true if you lose control and collide with something bigger, and more stationary than a deer. Take a moment to reflect. First, look for the road signs. The yellow diamonds with the deer on it are placed in high-traffic areas for deer. You may also spot a deer because their eyes will brightly reflect a car’s headlights, making them easier to spot. Stay Center. On a multi-lane road, the center lane is your safest bet for avoiding a deer collision, as long as your local traffic laws permit it. This gives deer plenty of space; and in case your vehicle does startle them, it gives you more time to react if one darts onto the road. Stay the course. If you see a deer, brake firmly and calmly, and stay in your lane. Swerving could make you lose control of your vehicle and turn a bad situation much worse. Not to mention, deer are unpredictable, and you could swerve directly into their changed path. Honk! Some experts recommend that one long blast of the horn will scare deer out of the road. Do not rely on hood whistles or other devices designed to scare off deer—studies have shown them to be largely ineffective at minimizing accidents.